This weekend I did a quick trip to the Galleria for a pair of cheap flat sandals, but left with a lot more than that. Below are some great deals I found! After finding nothing in Nordstrom’s, I walked over to Aldo (I did say cheap!) and found a pretty cute pair of gold braided flip flops. What I wasn’t expecting to find was two awesome necklaces for $18 each (see below)! The first is a long, chunky beaded necklace that would look great with a plain black or white tank top and shorts – a bold and bright accessory that makes a statement! 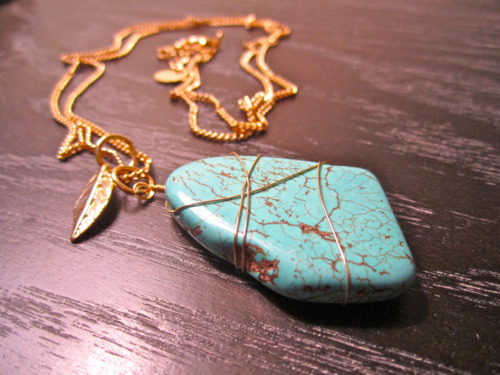 The second is a single piece of faux turquoise that has been wire wrapped and placed on a very long gold strand. As this is a pretty simple piece, it could go with pretty much anything! Find both necklaces at Aldo! After purchasing those items from Aldo, I walked across to Urban Outfitters on the off-chance they would have a cute sundress I could get to wear for the barbecue I was supposed to attend in a few hours. Not only did I find the dress I wore to the day party, I found two other great items! First was a perfect striped blouse to pair with shorts or white jeans (pictured below – at Urban for $59). 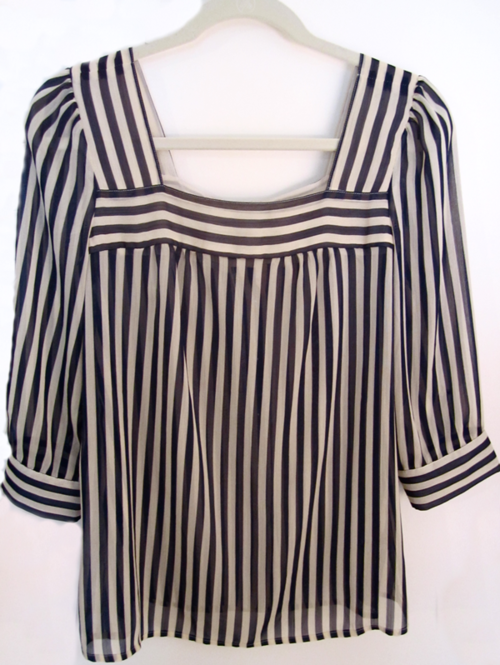 The blouse has identical fabric buttons all the way up the back giving it the perfect amount of detail. I always love how Urban combines new trends with old school glamour – they always have ultra chic pieces that have that vintage look yet still give off a young, fresh vibe. Second, was a modest cream colored sheath (bottom left) that I plan to wear with a black belt for $79 (I don’t think the website gives the best portrayal of the dresses, but trust me, they are adorable!). Lastly, was the black crossback dress with white polka dots which I ended up wearing to the barbecue – very form fitting and comfortable, also $79. Photo credits Urban Outfitters.